You can keep your Stilton with ginger and mango, I’ve never really been a fan of the “cheese with stuff in it” genre. I’d rather find the tastiest cheeses, and pair them with delicious accompaniments. As luck would have it, we just found some really good “stuff” to put on our favorite cheeses. Quince and Apple is a small husband and wife owned company dedicated to making small-batch preserves that capture the bounty of the Upper-Midwest. As major turophiles and natives of the Great Dairy State, each of their preserves are designed around pairing with cheeses, and are made when local fruits are at the height of their short Midewestern growing season (save for citrus and figs) and are stockpiled throughout the year so that you can enjoy perfectly tart door county cherries during our frigid Minnesota winters. 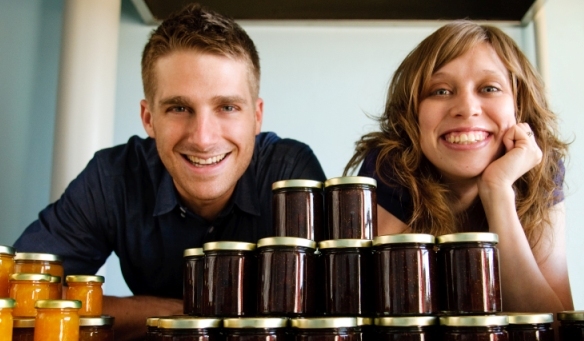 Matt Stoner Fehsenfeld grew up making jam from the fruits his family grew in their backyard. After managing an organic co-op, getting a culinary degree, and cooking in high-end restaurant kitchens, he started playing around with jams and jellies using unique flavor combinations as gifts for his friends and family. Demand for his products from a few local specialty food shops led him to rent out a commercial kitchen, and use their living room as warehouse. It wasn’t long before his side-hustle became a full-time gig. Clare, who has a dual major in music performance and biology, and also enjoys reading business books for fun, was the perfect left-brained accomplice to Matt’s creative tinkering, and quickly assumed the role of Chief Operating Officer. Today they’ve outgrown both the commercial kitchen, and their living room, and have their own production space and warehouse in Madison. Despite their larger facility, every aspect of production is still done entirely by hand, from ladling the jam to labeling the jars! In a world now saturated with “artisan” products marketed to their “foodie” demographic, sometimes it is hard to find products with substance that goes beyond the marketing guff. Quince and Apple makes beautiful preserves with fresh, well-balanced flavors using the best ingredients they can find, and a deft hand when it comes to adding sugar or aromatics… and they look nice to boot. We stock all of Quince and Apple’s preserves in retail 6oz jars, sold 12/CS, however all of their flavors are also available in more economical foodservice sizes; give us a call for sizes and pricing. Quince and Apple also makes a line of superb fruit based syrups for sodas and cocktails. We are looking forward to selling them soon! Peach Chamomile – Ripe peaches steep in rich chamomile tea, creating a luscious preserve with notes of maple, brown butter and wildflower honey.Our favorite pairings include aged gouda, washed rind cheeses and creamy blues. Of course a pastry would be delightful too. Figs and Black Tea – Full-bodied black tea and sweet, delicate figs combine in sultry counterpoint, creating a thoroughly seductive preserve. Spread on a sliced baguette or good cracker with goat cheese and prosciutto. Spoon over vanilla ice cream for an out-of-the-ordinary dessert. Raspberry Rose – Ruby raspberries sparkle in this bright preserve. Lush fruit and floral rose create notes of cherry, punch and lime. Top a tart or bring a big cheese to life. Try an aged gruyere or bold mimolette. Orange Marmalade with Lemons – If a preserve can be sunny, this one definitely is. It practically bursts with light and satisfaction and finishes like a sweet summer day. Spread plain on a piece of toast with real Wisconsin butter. Add some zest to your cooking by stirring into marinades, vinaigrettes and sauces. Pear with Honey and Ginger – Fresh from the orchard, ripe pears and crisp apples luxuriate in lush honey and warm grated ginger. This preserve demands a good pastry – top a croissant, Danish or cider doughnut. Or, stir into your favorite muffin recipe. Pair with a sharp or bandaged cheddar or a wedge of triple-creme Brie. 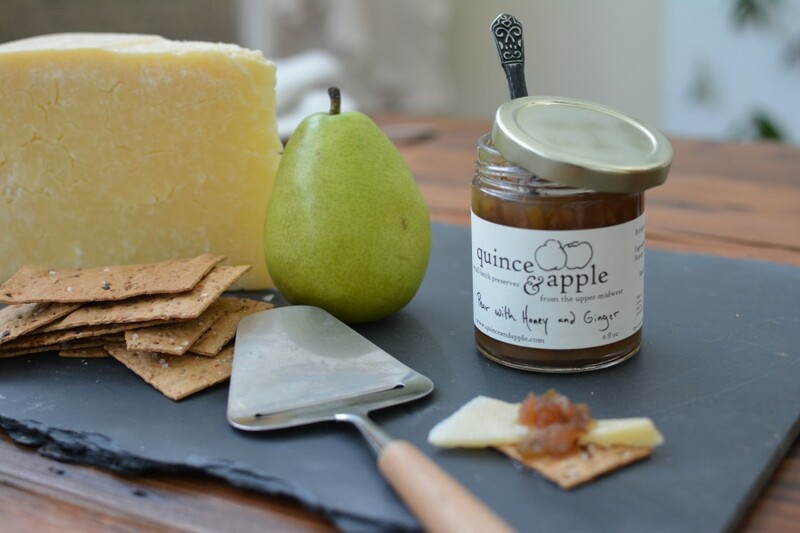 This preserve is made with local honey, and local pears and apples when they’re in season! Shallot Confit with Red Wine – A robust, self-assured preserve with an elegant streak. Bold red wine brightens the deep caramels of slow-cooked shallots. Pair with blue cheese and sharp cheddar. Liven up a smoked turkey sandwich or top a steak or grilled chicken. Tart Cherry and White Tea – Door County tart cherries float in a delicate jelly of jasmine flowers and white tea. Seductive with a creamy bleu or full-fat soft rind cheese. Dainty on a shortcake with fresh whipped cream. Apples and Cranberry – A Thanksgiving favorite, this preserve is a combination of local apples, cranberries, honey, orange zest, ginger and bay leaves. This preserve pairs with an assortment of meats and cheeses like turkey, pork, or camembert for tart and savory dishes. Or, mix Apples and Cranberry with hot cider and rum and strain to create a warm cocktail.